Provide comfort for the family of Erma Foster with a meaningful gesture of sympathy. 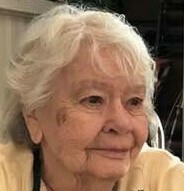 Erma Evelyn “Sis” (Lescarbeau) Foster, 85 of North Adams, MA, formerly of Florida, MA died on Wednesday, February 27, 2019 at her home. She was born in North Adams, MA on May 2, 1933 a daughter of Edward J. and Emaline Delia (Lord) Lescarbeau. She attended schools in North Adams, including the former Notre Dame School. In her younger years, Sis worked at Star Diner, Wall-Streeter, and the Pizza House. She was last employed at Williamstown Commons Nursing Home. Sis was a very devoted mother. She was a member of the Red Hat Society Club in North Adams and Florida, MA, and was also a member of the Florida Senior Center. She was the widow of Nelson Joseph Foster Jr., whom she married on June 14, 1952 at Notre Dame Church. He died on January 7, 2002. Survivors include daughters Linda Coolman and her husband Richard; Nancy Baer and her husband, Phillip; Barbara Wilson and Michael Goodson; and Leslie Thomasson and her husband, John; son Nelson J. Foster III and his wife Linda; thirteen grandchildren; seventeen great grandchildren; sisters Theresa Grieger; Bernadette Aubin; and Emaline Goddard; and brothers Leon, Norman, and Harold Lescarbeau. She was predeceased by her son Walter W. Foster who died on March 7, 2016; as well as her brothers Edward, Felix, Lawrence, Richard, David, Donald, Louis, Howard, and Henry Lescarbeau. FUNERAL NOTICE: A funeral service to celebrate the life of Erma Foster will be held on Monday March 4, 2019 at the Flynn & Dagnoli Funeral Home, WEST CHAPELS, 521 West Main St. North Adams, Ma. at 7PM. Burial will take place in the spring in the family plot in Eastlawn Cemetery,Williamstown, MA. Calling Hours at the funeral home are Monday from 4-7 PM. Memorial donations are suggested for PopCares through the funeral home. To add to the Book of Memories, please visit www.flynndagnolifuneralhomes.com. To send flowers in memory of Erma Evelyn "Sis" Foster (Lescarbeau), please visit our Heartfelt Sympathies Store. Carver Family Dentistry sent flowers to the family of Erma Evelyn "Sis" Foster (Lescarbeau). I'm so sorry for your great loss. May you find comfort in all your cherished memories of Erma. Jesus gave us an encouraging promise of a resurrection in the Bible at Acts 24:15; Luke 23:43. This provides comfort and hope that one day our loved ones will be raised to life on a restored paradise earth, with the prospect of never again having to suffer or die - Revelation 21:4. More Bible thoughts to help you cope may be found on jw.org. Our hearts and prayers go out to you and your family in this time of loss. Carver Family Dentistry purchased flowers for the family of Erma Foster.